Eggplant Curry:Eggplant is one of the most versatile vegetables around. 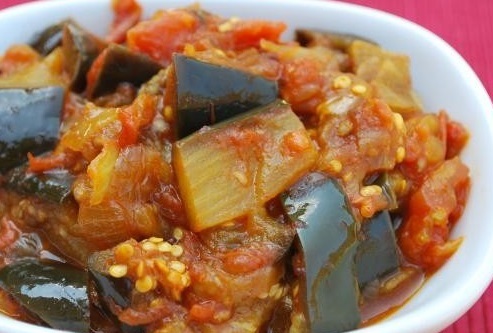 Eggplant curry is one of the most simple and delicious recipe. The buttery texture of the eggplant curry goes well with steamed rice or chapati. Cut the eggplants into 1-inch pieces. Put the eggplant pieces into a strainer and sprinkle liberally with salt. Place a small plate on top of the eggplant, and a weight on top of the plate. Leave aside for at least 30 minutes. Note: This process draws the excess water out of the eggplant, and it won’t be overly salty. Heat 1 1/2 tbsp oil in a heavy pan. Add in the sliced onions, garlic and ginger. Turn the heat to medium, and cook till the mixture is nicely browned. Add cayenne pepper, turmeric powder, garam masala powder and cumin powder to the onion mixture. Add water and tomato paste. Reduce heat to low and mix well. Let the sauce cook gently, but don’t allow it to become dry. In a large skillet, heat 1 1/2 tbsp oil over medium heat. Add the eggplant pieces to the pan. Saute until all sides are brown and crisp. Once all eggplant pieces are browned, incorporate them into the sauce pan, making sure to cover all pieces with the sauce. Add lemon juice and salt, to taste. Cook gently until eggplant is cooked through, takes about 15-20 minutes. Eggplant curry is ready to be served. Serve eggplant curry with steamed rice or chapati. If you have any queries regarding the Eggplant Curry recipe, please leave a comment.